Grove Breakout for LinkItTM Smart 7688 Duo is a Grove port integrated and a feature expansion board for LinkItTM Smart 7688 Duo development board. This breakout board will save a lot of work for quicker prototyping, especially for novices through simplified wiring procedure. So it will help a beginner get a quick start. It supports serial buses like I2C, UART and provides access to reserved original pins of LinkItTM Smart 7688 Duo. LinkIt Smart 7688 Duo(a compact controller board) is an open development board, based on the OpenWrt Linux distribution, MT7688 and ATmega32u4. The board is designed especially to enable the prototyping of Rich Application IoT devices for smart house. Other pins connect with ATmega32U4. It will remind you when you have a new 'like' on your facebook page. 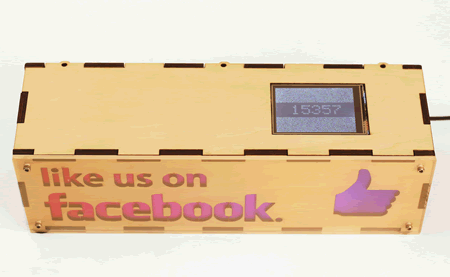 The device will vibrate，the lights will twinkle, while the screen will show the real-time facebook likes. Learn more at our Recipe. Grove Breakout for LinkIt Smart 7688 Duo is a grove port integrated and a feature expansion board for LinkIt Smart 7688 Duodevelopment board.